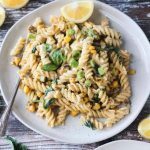 Creamy Sweet Corn Pasta – this incredibly delicious pasta dish makes use of the best summer sweet corn. Dairy free, gluten free depending on the kind of pasta you use, and kid-friendly. 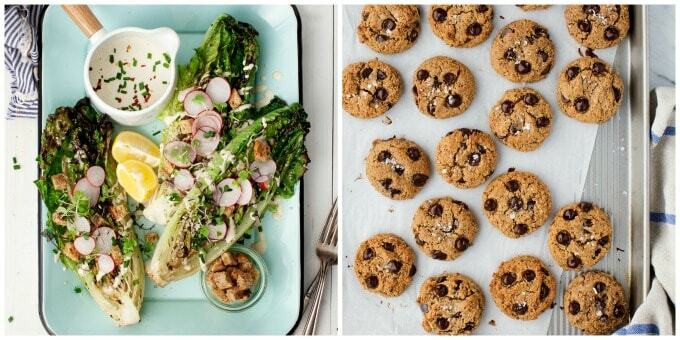 You’ll want to eat this meatless dish all summer long! Just want to let you know that I received a free copy of this cookbook for review. As always, I only recommend products that I use and love myself. All opinions are my own. Thank you Avery Books for gifting me this gorgeous cookbook! 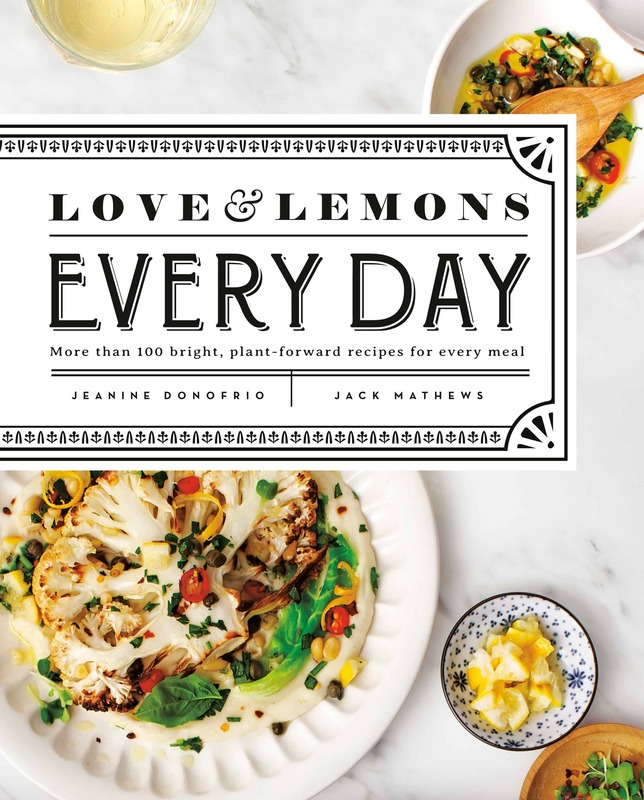 I’m so excited to bring you a full review of the cookbook, Love & Lemons Every Day: More than 100 bright, plant-forward recipes for every meal, by Jeanine Donofrio, along with the recipe for yummy Creamy Sweet Corn Pasta. This is Jeanine’s second cookbook. I introduced you to her first book, Love & Lemons Cookbook, a few years ago and featured the recipe for Portobello Sliders. If you loved the first one, you’ll love this one, too! And even if you don’t know about the first one, let me assure you, you need both books on your shelf! Keep reading to find out what I love most about this cookbook and to get the recipe for this dreamy pasta! Jeanine calls it Creamy Sweet Corn Pappardelle, but I used rotini pasta instead of pappardelle. Use whatever pasta you like best! Jeanine’s first book was organized by ingredient, which is wonderful for those times when you grab the best looking produce at the farmers’ market and afterwards need to figure out what to do with them. This second book is organized more traditionally by course. Both books are a celebration of fruits and vegetables. You don’t have to be vegan, vegetarian, or plant based to appreciate truly delicious food and that’s what you’re getting here! All recipes are vegetarian, most are vegan. For the one’s that aren’t vegan, Jeanine gives substitutions on nearly all of them so you can make them vegan. Many are also gluten free. There is definitely something here for everyone. Photo credit: Jeanine Donofrio and Jack Mathews. Permission to reprint by Jeanine Donofrio and Avery Books. For Dinner ~ Cozy Vegan Mushroom & White Bean Potpie; Turmeric Spiced Whole Roasted Cauliflower; Rutabaga Walnut Ragu; and the Creamy Sweet Corn Pasta I’ve featured below. Drooling yet? Grab a copy of the book and get cooking! Photo credits: Jeanine Donofrio and Jack Mathews. Permission to reprint by Jeanine Donofrio and Avery Books. In addition to the recipe chapters, Jeanine walks you through which produce is in season when and how to season them for optimal flavor. She even gives tips for tweaking flavors at the end of a recipe in case you’ve accidentally made something too spicy or too tangy, etc. You’ll even learn some tricks for using up the parts of vegetables most people throw away, like beet greens, carrot tops, and broccoli stalks. 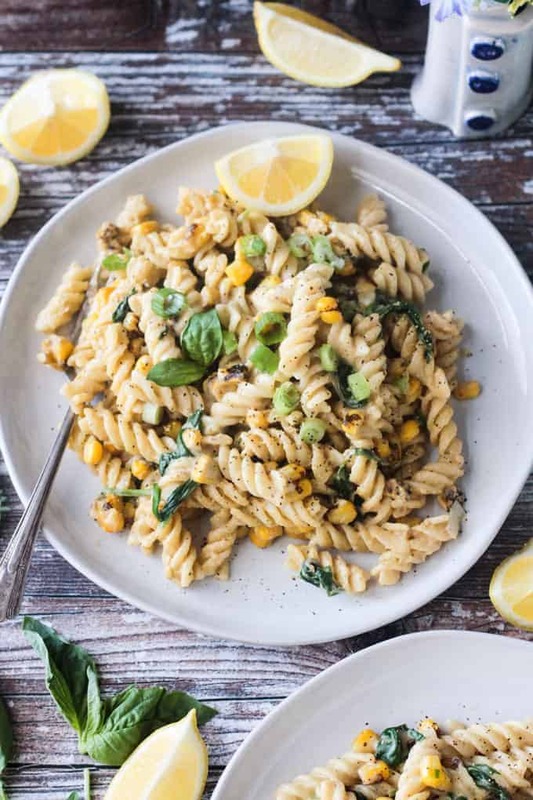 In the Creamy Corn Pasta recipe featured below, you’ll be using not only the corn kernels, but also the liquid scraped from the cob. Spoiler alert: It brings amazing flavor! And if that wasn’t enough, there are Special Occasion Menus listed to take all the guess work out of pairings. Some example menus you’ll find are for Backyard BBQ, Girls’ Night, and Fall Harvest Feast. 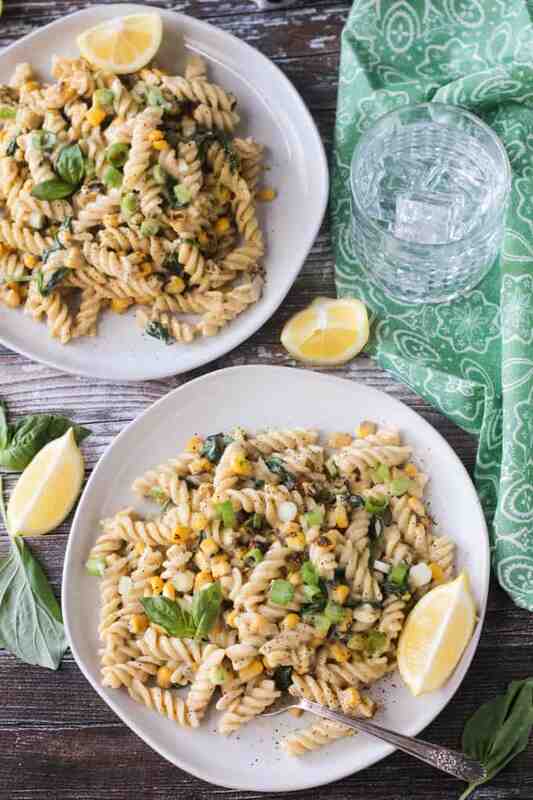 I hope you love this Sweet Corn Pasta as much as we do. If you try it, please come back and leave me a comment below with your feedback and star rating. 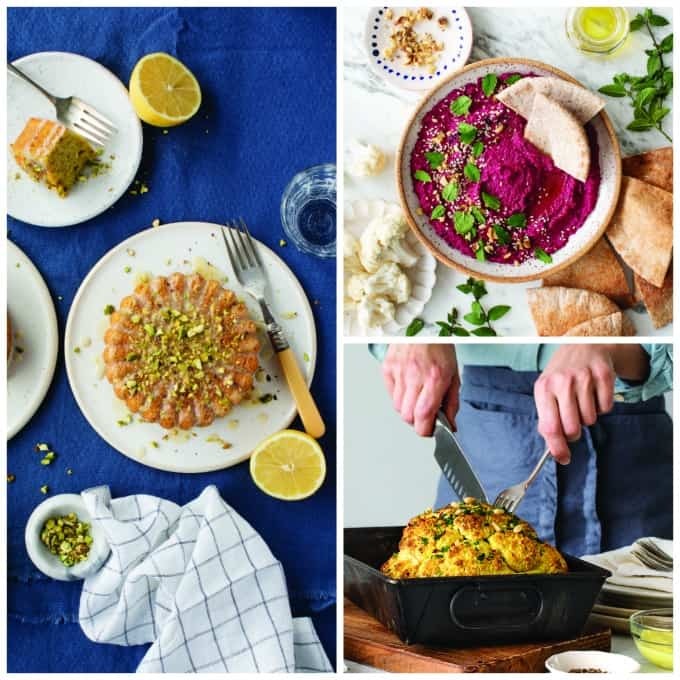 And don’t forget to grab your copy of Love & Lemon Every Day to enjoy all of the delicious recipes inside. Jeanine says, "My favorite thing about Chicago in the summer is that sweet corn is everywhere. There’s nothing like fresh, midwestern bicolored sweet corn, and I like to use it every day while it’s available during its relatively short season. 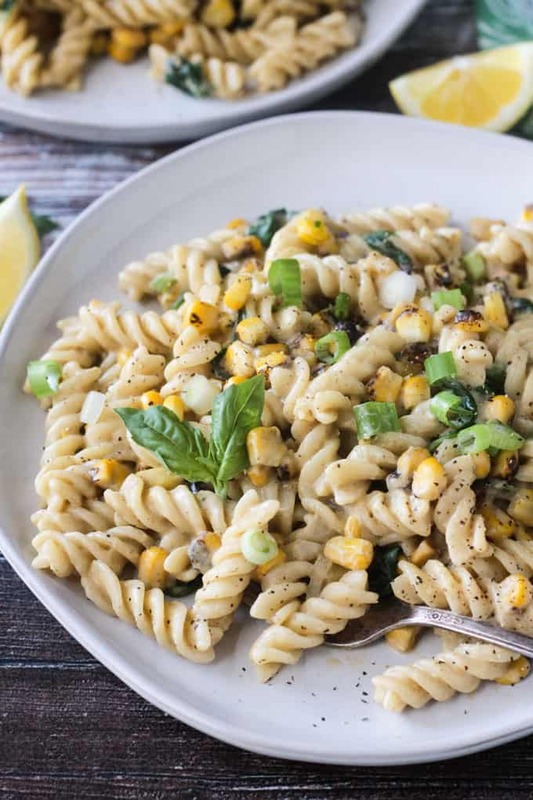 In this pasta, the sweet, juicy corn kernels paired with the “milk” from the cobs become a perfect cream sauce without using actual cream. Cashews add richness, lemon (of course) adds some zing, and smoked paprika adds a smoky depth of flavor." Permission to reprint by Jeanine Donofrio and Avery Books. Heat 1 tablespoon of the olive oil in a medium skillet over medium heat. Add the onion and cook until soft, about 3 minutes. Add 1½ cups of corn kernels and the whole crushed garlic cloves and cook until tender, about 3 minutes more. Transfer to a blender with the cashews, water, lemon juice, smoked paprika, the ½ teaspoon of sea salt, and a few grinds of black pepper. Blend until creamy, adding more water as needed to create a pourable consistency. Set aside. Bring a large pot of salted water to a boil. Prepare the pasta according to the instructions on the package, cooking until al dente. Reserve ½ cup of the hot pasta water, then drain. Meanwhile, wipe out the skillet and heat the remaining 1 tablespoon olive oil over medium heat. Add the remaining 2½ cups of corn, the scallions, a pinch of salt, and a few grinds of black pepper and cook, stirring occasionally, until tender, about 3 minutes. Add the spinach, hot pasta, the corn sauce, and ¼ to ½ cup of the reserved pasta water, as needed to create a creamy sauce. Season to taste and serve immediately with the sliced basil and microgreens, if using. ~Use gluten free pasta to make this recipe gluten free. Looks interesting enough to try! Definitely, you could do this oil free. Just use some veggie broth…or even water…start with 1/4 cup and add more if needed so veggies don’t stick. Enjoy!